Charles Cordier, Bust. 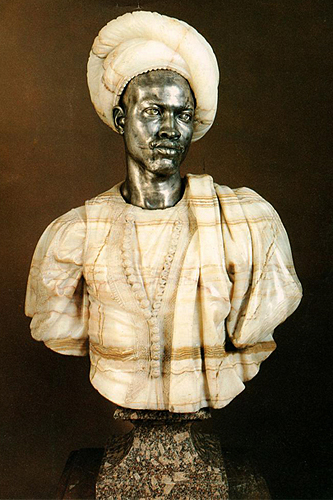 Nègre en Costume Algérien or Nègre du Soudan, ca. 1957. "Why are we reintroducing this series, and why in this form? Why undertake such an enormous project? simply put, the bound, physical book is the perfect format for the information in this project. This is a lavishly illustrated series, containing over 3,000 images of art housed in over 500 museums and collections around the world. Currently, the fees charged for digital rights, as opposed to print, are just prohibitive. Meaning that there is no way we could afford to offer these images in any digital format for a price that would get these books distributed anywhere near as widely as the project deserves. We couldn’t do an ebook, we couldn’t do a comprehensive website, we couldn’t do a dvd." These words describe a fascinating project on the Image of the Black in Western Art, which began in 1960 with the determination on the part of John and Dominique De Menil to collect and document images of people of African descent as portrayed in the course of the history of Western art. The resulting book projects were first published by Harvard University Press in the 1980s. The archive of images presently resides at Harvard University under the direction of the W.E.B. Du Bois Institute for African and African American Research. Harvard University Press has undertaken to republish these books in fuller form and/or expanded versions of the first publications for a total of 10 books in 5 volumes, the last scheduled to be released in 2015 (the volumes go as far back as the Ancient world). I have purchased five of the ones that are currently available with a focus on the period of the Renaissance in the West through the 19th century, not being able to figure out how to get the info they contained any other way although each volume is about $100 and I would have certainly avoided spending that money if I could have found another way to have complete access to the materials contained there in. Will endeavor to make sure that the CUNY Graduate Center has all the volumes and can make them available to our students. I think it would actually be a great idea to republish these essays in a cheaper format, perhaps even with just lists of the pictures. Part 1--Slaves and Liberator Part I, expanded to include more color illustrations. Part 2--Black Models and White Myths, New Edition Part 2 expanded to include essays on Goya by Victor Stoichita and on Russian painting by Paul Kaplan. all edited by David Bindman and Henry Louis Gates, Jr. They are of great interest to me from a research standpoint in relation to my current teaching and reading on "Slavery and the Failure of Reconstruction"first in the United States in the 19th century and then throughout the New World from the commencement of slavery in the Dominican Republic in the 1500s through its official demise in the late 19th century in Cuba and Brazil, and my fascination with race and slavery as the object of an expanding terrain of of iconography and visual representation. Although there has been much critique, a lot of it no doubt justified from the standpoint of specialization in these areas, I owe a great debt to Henry Louis Gates, Jr.'s recent endeavors to present slavery in the context of the longer history of the New World beginning with the Spanish conquistators and their earliest adventures in the New World, in which blacks were included, pictorially and otherwise at an introductory college level in the new textbook Life Upon These Shores and his series and book on Blacks in Latin America). Differences of language and lack of translation into english has held this door closed for a long time to the generalist. Now that Gates has thrown it open for me, it has led me to a considerable number of of other works in english exploring this world as well. I am a writer and a professor of English at the City College of New York, and the CUNY Graduate Center. My books include Black Macho and the Myth of the Superwoman (1979), Invisibility Blues (1990), Black Popular Culture (1992), and Dark Designs and Visual Culture (2005). I write cultural criticism frequently and am currently working on a project on creativity and feminism among the women in my family, some of which is posted on the Soul Pictures blog.